I decided it was time for a small adventure. I was looking for a place to take some pictures. We got in the car and headed to one of our favorite places. Saturday (6-6-2015) the kid and I went to a local restaurant called Young’s Jersey Dairy. They cater to ice cream and Jersey cows. They have Putt-Putt, batting cages, picnic area, they have a full restaurant, gift shop, ice cream parlor, tractors for the kids to play on and live goats and cows. A fun place for the whole family. The kid and I were there so we could get an ice cream and take pictures of the animals. I wasn’t raised on a farm but I have fed goats when I was a teenager. Cows, well that’s a different story. I have not been close to a cow, ever. I have seen them in the fields and at county fairs but I have not been within arm’s reach of a cow. Furthermore, I know nothing about how a cow reacts, if they are mean, if they bite, nothing. They are large animals and that scares me. We finished taking pictures of the goats and was walking out of the barn when I noticed that the cows were coming our way. I was excited. I was able to take some photos of the cows in the field about 30 yards away from the fence line we were standing at. I noticed that a few cows were going a different direction than the others. They were headed in ‘OUR” direction. I was still excited but now a little nervous, thinking that I was going to be real close to the cows. There were about 6-8 cows in this little area. The only thing separating me and the cows was a wooden fence. But I was taking pictures and was thrilled about that. But here comes one cow. I call her Bessie. I noticed her face, almost sweet, kind and gentle looking. The kid even noticed her, saying” she is picture perfect, Mom”. I’m thinking, what a great opportunity to take her picture. So I raise up my camera and every time she looks up, she is facing away from me. Like she knows what I am doing and now is playing a game of peek-a-boo. After 5 minutes or so playing this game, I realized there are now about 4 cows by the fence line where I am standing. So I turn my back on Bessie and focus my attention on the other cows. That’s when my kid asked “do you hear that”? It was the sound of popping or clicking. It was a popping sound as if you put your finger on the inside of your mouth to make a sound. That’s when we saw him. A cow with his tongue going in and out of its mouth like he had peanut butter stuck to the roof of his mouth. We called him, Mr. Peanut Butter. 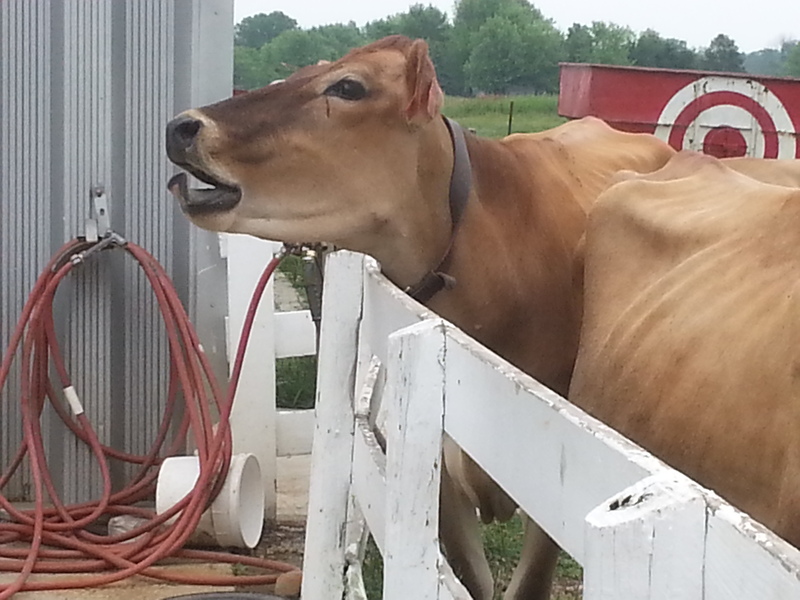 This cow was flicking his tongue on his teeth and cheeks to make that popping sound. He seemed to be proud of his accomplishment. Mr. Peanut Butter would raise his head high and his tongue would go crazy. I was taking pictures left and right of Mr. Peanut Butter. My son was giggling and so was I. We had no idea that a cow could even do that let alone act like he was begging for your attention. That’s when it happened. I am leaning on this fence laughing at this cow making popping sounds with its tongue and I feel a puff of warm air hit my right shoulder, then I get this waft of an odor, it’s the smell of sweet grass that has a hint that the grass has soured. I turn around and Bessie is 2 inches away from my face. Her face was almost resting on my shoulder. If I wouldn’t have been so freaked out, it would have been the perfect ‘selfie’ picture. She scared the bejeebers out of me. I took a step back and she stayed right there with her head over the fence. Looking so sweet and kind at me. As if to say, I’m ready for my close up. Since Bessie was posing for her photo op, I was able to take some good pictures of her. This lasted about 10 minutes. While I am taking picture of Bessie, Mr. Peanut Butter decides he isn’t getting enough of our attention and decides to walk down to us and stand beside Bessie and do his tongue trick to get our attention. 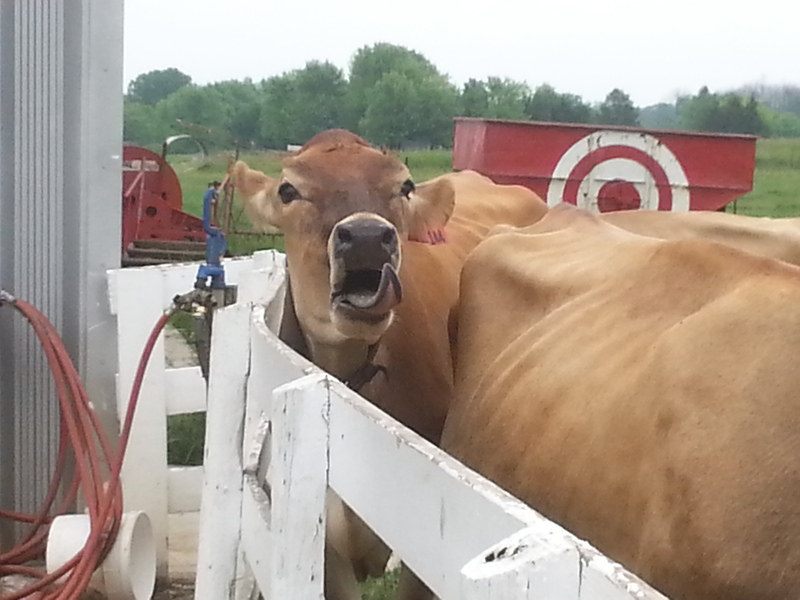 Who knew cows had personalities let alone want or need our attention? 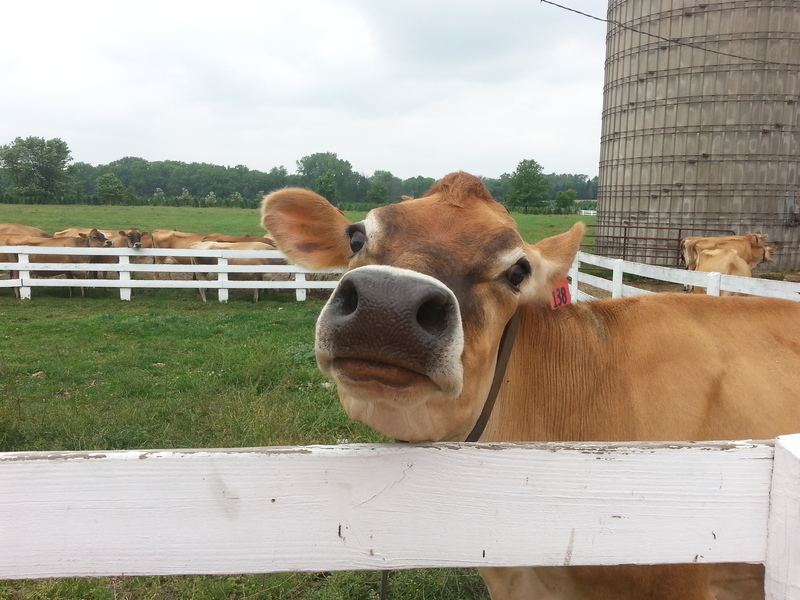 I have learned a few things on our little adventure to Young’s Jersey Dairy. First: Cows have personalities, Second: Cows are entertaining. Third: I am no longer nervous around these kind creatures. Mr. Peanut Butter with his tongue out. What a fun day we had. I’m amazed that my kid still wants to hang out with me. Grateful that we have another fun/funny memory to share. One a side note: A joke my kid made up years ago. Joke: What does a dyslexic cow say? Tell me about a funny adventure you have been on. Categories: Adventure, Cows, Just Because, My life | Tags: adventure, cows, facing my fears, finding joy, Happiness, Jersey cows, Joy, my life, Peanut Butter, simple things, Young’s Jersey Dairy | Permalink.